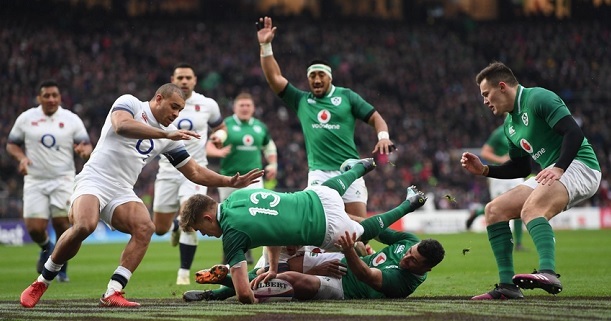 Ireland and England will open their 2019 Six Nations campaigns against eachother at the Aviva Stadium, in what should be a mouthwatering clash. The Irish have firmly affirmed themselves as the second best team in the World behind the All Blacks, and could even overtake them for the No.1 spot in the rankings if all goes well in this years` Six Nations. Ireland is the reigning Champion in the competition, having won the Six Nations last season with 5 wins out of 5 – claiming the Grand Slam as a result. Ireland has been truly great over the last couple of years, and 2018 was exceptional for the men in green. They lost just one game out of 12 (in Australia), and have been in blistering form in the November test window, when they even managed to claim a 16-9 victory against New Zealand! England had a superb couple of years after a disappointing 2015 Rugby World Cup, but the Three Lions have clearly taken a step back recently. Last year was a very poor one, with England finishing 5th (!!) in the Six Nations, losing 3 games out of 4 in the June test period, and having a rather average November test window for their standards. It has to be said though that England finished 2018 strong with a massive home win over Australia, so they will look to build on that. Bet on Ireland vs England and claim your 100% (120 Eur) welcome bonus at LSbet! Ireland enters this match almost fully healthy. They will field their standard first choice pack, and they look scary good from 9 to 15 as well. England is struggling a bit with injuries, as they will miss guys like Te`o, Watson, Underhill, Shields or Cokanasiga, while key players like Farrell, Vunipola or Tuilagi have either just returned from injury, or haven`t played at the highest level lately. England has tons of depth and their lineup looks strong indeed, but one has to feel that they will still be hurt a bit by missing a few players, along with a couple of others having questionable fitness – especially since Ireland is healthy. The way Ireland has been playing last year, and looking at the lineup they will field in this match, it`s very hard to see past them. They are healthy and clicking on all cylinders, while England is not looking very well. The English have the talent, but they are not working well together, and some players are out of form. Ireland won the last H2H meetings, including a 24-15 win in London last year. Not much has changed since then, so if Ireland won by 9 away, you would back them to do at least the same at home – where they also beat New Zealand by 7 just a couple of months ago. Look for the Irish to create havoc out wide with their pace and technique, and they should definitely dominate the kicking game as well – particularly as England`s Daly has been dreadful lately at 15 for both club and Nation. In the pack, you can not say England is stronger either. Weather is expected to be clear and sunny come game time, which won`t necessarily favor anybody, but it might represent a tiny edge for the more attacking and creative team – which should be Ireland. England will always be dangerous and will not go down without a fight, but this game has Ireland written all over it. They are spectacular right now, have the all important home court advantage, and should be able to exploit England`s weaknesses. Rating England as an 8 point underdog may seem high at a first sight, but if Ireland imposes its dominance as expected, they could easily create a two try cushion. My tip will be Ireland to cover the 8 point (asian) handicap. If you can`t find the -8 asian, you should be able to find the -7,5 at slightly lower odds, at least at the moment when I am wrapping up the preview. The 8.5 would be a bit more risky and I would decrease the stakes a bit on that, if you can`t find anything else. Prediction: Ireland – England 29 – 16.